Imagine that, while dreaming up your next big travel adventure, you could slip on a pair of glasses and test out the views at a few different destinations. Or, while scrolling through a list of flights or hotels, you could take a virtual tour before making your purchase. Virtual reality (VR) and augmented reality (AR) technologies were selected by Lonely Planet as one of the trends expected to take the industry by storm in 2019. Whether igniting the travel bug with a 360-degree view or enhancing a historic trip with augmented re-enactments, this technology has the potential to completely overhaul the travel experience. One country that is already becoming a hotbed of activity for VR and AR is the UAE. The market for these technologies is expected to grow at an annual rate of 55 percent from 2017 to 2023, according to market research firm 6Wresearch. Meanwhile, International Data Corporation has predicted that the market for VR and AR in the Middle East and Africa region will reach a value of $6bn by 2020. Dubai has been positioned as the tourism hub of the Gulf region. The emirate – one of seven that make up the country – is well on its way to becoming one of the most visited cities in the world. According to the latest Mastercard Global Destination Cities Index, Dubai was the fourth-most visited city in the world in 2017, with 15.79 million travellers. The index predicted that tourism would grow by a further 5.5 percent in 2018. Tourism has become an economic boon for Dubai, generating $7.6trn in 2016, or more than 10 percent of GDP, according to the World Travel and Tourism Council. The industry also supported 292 million jobs globally, equal to one in 10 jobs. At the same time, the UAE has demonstrated its regional leadership in emerging technologies. Throughout the country, companies in retail, real estate and events drive innovation by embracing advances in technology, such as VR and AR. For instance, in 2018, the world’s biggest ever VR park was introduced in Dubai, offering numerous virtual experiences and games. The 7,000sq m VR Park Dubai, which is located in the Dubai Mall, was a first-of-its-kind attraction in the Middle East. Mirza was first inspired by the possibilities of virtual and augmented technologies when he saw Nike using AR to enhance the shopping experience for its customers. From that moment, he saw just how widespread the disruption caused by VR and AR would be. “VR [and] AR are game changers,” Mirza said. “[They are] changing how we collaborate, how we communicate and how we work or even shop.” But not only are these technologies changing the way we consume content and entertain ourselves, they are also transforming the way we interact with the world. There is almost no segment of the travel industry that VR or AR could not disrupt. One simple way companies are bringing the tech into the mainstream is by slotting virtual or augmented attractions into popular tourist hotspots. For instance, in the Dubai Mall, virtual and augmented technologies are not only being used in the VR Park, but also in the VRZOO at the Dubai Aquarium and Underwater Zoo. This immersive experience allows consumers to take in 360-degree views of threatened species in their natural habitats, from gorillas in the Ugandan forests to whale sharks in the Maldives. 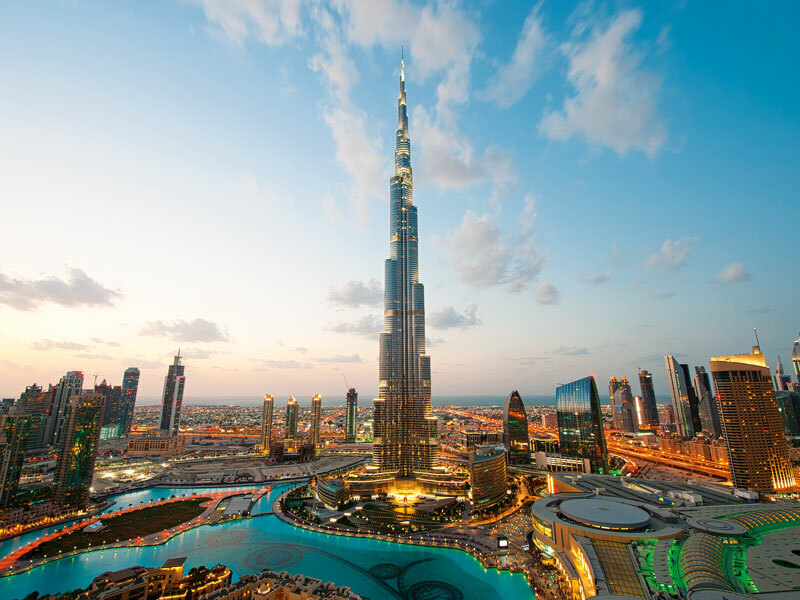 The Burj Khalifa – the tallest building in the world – is another prime example. AR and VR services company ARküb installed interactive telescopes in the building in 2014 to enhance the consumer experience of identifying landmarks from the 124th and 125th floors of the 828m-tall building. Visitors can also take a VR adventure in the Burj Khalifa in which they climb to the top of the building before free-falling all the way down to the ground. The ride was borne out of a partnership between HTC Vive Pro and real estate company Emaar. Major airlines such as Emirates and Etihad Airways have introduced VR services that allow flyers to preview the look and feel of an aircraft before stepping inside. The emirate of Ras Al Khaimah has used VR to promote one of its top tourist spots: the world’s longest zip line. The emirate’s tourism department brought the zip line to the UK by equipping Brits with a VR headset that would transport them to the UAE with 360-degree-views of the mountainous landscape. With an increasing number of companies finding success in VR and AR technologies, Mirza said that now anyone with a decent 360-degree camera could create their own virtual worlds. Hassan Kiyany, a visual storyteller from the UAE and the founder of immersive video production agency Kiyany, has become a leader in the creation of VR experiences. In 2015, Forbes Middle East named Kiyany as one of the leading media storytellers in the UAE, and he has won multiple awards for his films. By inspiring people around the world to take a look inside a city they might not have ever considered visiting, Kiyany said virtual films could have a big impact on travel and tourism. “We can bridge a gap to make it easier for people to explore another culture. It can be eye-opening and very powerful,” he said. The UAE has developed a modern approach to tourism that could soon pay dividends. If it continues to find innovative ways for VR and AR technologies to transform its tourism sector, it may one day achieve its dream of making Dubai the most visited city in the world.